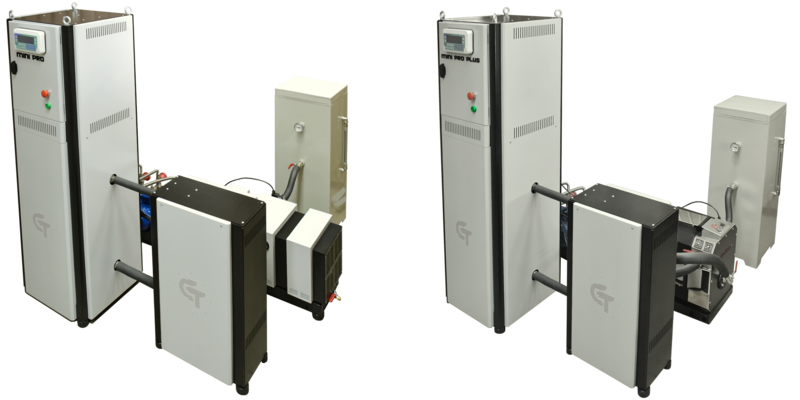 In view of the high demand for small-scale automatic machines our company has started to produce the advanced models for professional use – Biodiesel-MINI Pro and Biodiesel-MINI Pro Plus. New design. New software. More accurate, more productive, more reliable. All mechanisms have European ATEX explosion proof certificate. The Biodiesel-MINI Pro and Biodiesel-MINI Pro Plus (of higher capacity) systems are aimed at a wide range of users such as small companies, municipalities, farms and even at domestic use. To operate the systems no specific skills and qualification are needed. Being easy to use Biodiesel-MINI Pro and Biodiesel-MINI Pro Plus ensure reliable operation. Biodiesel-MINI Pro can produce up to 100 liters of biodiesel per hour (more than 2 cubic meters per day). Biodiesel-MINI Pro Plus produces up to 150 liters of biodiesel per hour (more than 3 cubic meters per day). 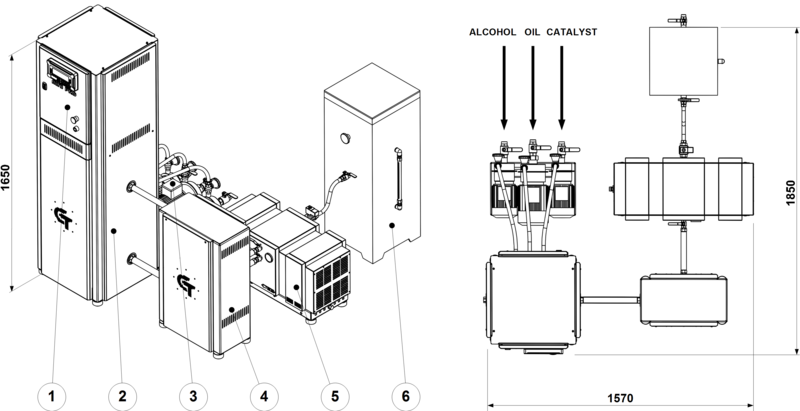 The base of these innovative systems is the cavitation magnetic-impulse reactor PULSAR-CT 805for Biodiesel-MINI Pro and ROTON-7BB B for Biodiesel-MINI Pro Plus, which provide a fundamentally new technology of the transesterification reaction conducting. The magnetic-impulse high-frequency cavitation processing proceeds in the reactors on molecular level. All components are exposed to the impulses of the magnet-directed cavitation. The Biodiesel-MINI Pro system does not demand high quality initial oil or animal fat. The high-frequency magnetic-impulse cavitation reactors offer successful and steady operation using waste cooking oil from restaurants and bakeries, tallow, pork or chicken fat as well as mixtures of those as the source product. For any change of source oil or fat no special plant adjustments are needed. The required amount of alcohol and catalyst is minimal. Alcohol recovery is not required. By cavitation technology the amount of alcohol for the reaction matches accurately the stoichiometric composition, that is the minimum volume. The time of ready biodiesel production reduces by several times. By the conventional technology it is impossible to immediately produce biodiesel of proper quality. It must be washed with water to eliminate impurities and then dried to remove water from biodiesel which requires additional time, as well as additional power and money for the biodiesel production. By cavitation method of biodiesel production neither washing nor drying of ready product is required. All processes, including the initial products feeding, dosing, mixing, processing and filling of the separation tank, are fully automated. Due to the exclusion of the “human factor” and, therefore, the improvement of accuracy and stability of the initial products dosing the significant increase of the total capacity has been achieved. The quality, reliability and safety of our equipment is guaranteed by using the components with ATEX explosion protection certificates of the world’s leading manufacturers: Schneider Electric; Kobold; Tapflo and others. Biodiesel-MINI Pro has two working modes. One-cycle mode. An operator presses Start button. 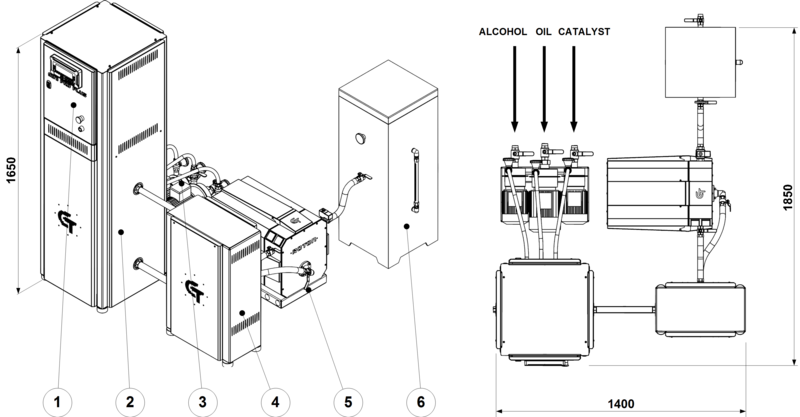 Dosing, mixing and processing of the three initial components are carried out automatically.When processing is finished, the processed mixture is pumped to the separation tank automatically and the controller turns off the system. The processing cycle is finished. To start a new processing cycle an operator should press the Start button again. One production cycle needs 40 kilograms of oil or animal fat with corresponding amount of alcohol and catalyst. Multi-cycle mode. An operator should use one big separation tank (or several smaller tanks), which total volume should be equal to quantity of cycles multiplied by 60 litters (the basic separation tank working volume for one-cycle mode). An operator can change the number of cycles from 2 to 50. When the quantity of cycles is set, an operator presses the Start button on the control panel. The system processes three initial components the same way as in One-cycle mode. When one processing cycle is finished the system starts next cycle automatically – without the operator’s participation. After the last cycle is finished the controller stops the system. In this mode Biodiesel-MINI Pro can work continuously twenty four hours a day. Using Biodiesel-MINI Pro in this mode one can produce up to 800 liters of biodiesel per shift (8 hours). Glycerin settling out. Depending on properties of source oil the settling process takes up to 60 minutes to separate the processed mixture into biodiesel and glycerin. After the separation of biodiesel and glycerol is completed, both products are discharged to the storage tanks and the separation tank is ready to receive the next charge of processed mixture. Separation tank. Material – Heavy-duty polypropylene, 77 liters.